The Tow Center for Digital Journalism at the Columbia Journalism School is partnering with faculty and industry experts from Columbia, Stanford and Tumblr to launch a mobile iPhone application aimed at providing "secure communication between journalists and their sources, as well as to support secure, real-time coordination and publishing for field journalists and newsroom editors," Columbia Journalism Assistant Professor Susan McGregor wrote in an e-mail to the Tow Center events listserv. The backers of the project, which is made possible with a magic grant from the Brown Institute for Media Innovation, plan to run a test of the application on Election Day with participation by student, professional and citizen journalists who are interested in photo-centric documentation of New Yorkers' Election Day experiences. "We welcome all types of coverage — anything from a few shots at your local polling place in the morning to complete coverage of neighborhoods all over town," McGregor wrote in the e-mail. Interested participants can sign up to participate in the trial, through an iPhone is required, and selected participants will need to participate in an orientation session next week. All text and photo content will be posted to a collective Tumblog after being reviewed by Tumblr editors throughout the day. The Dispatch website explains in further detail how the application provides secure, authenticated and anonymous instant publishing. All messages are encrypted and transmitted securely. A key-based authentication system verifies each message's source, but doesn't tie the key to the real person's identity. The application is designed to publish instantly "so that device destruction or confiscation doesn’t prevent essential reporting. An automatic 'sneaker-net' feature replicates content across devices if the internet is blocked or jammed, ensuring that coverage is preserved and published as soon as any connection can be established." The application also functions on a "no-touch publishing" basis once a channel such as a blog format, group chat or one-on-one has been selected to ensure that a message is posted automatically. The group chat function is envisioned as a way to allow secure group coordination, such as plans to meet for a protest. Viewing or editing contacts in the application requires authentication. 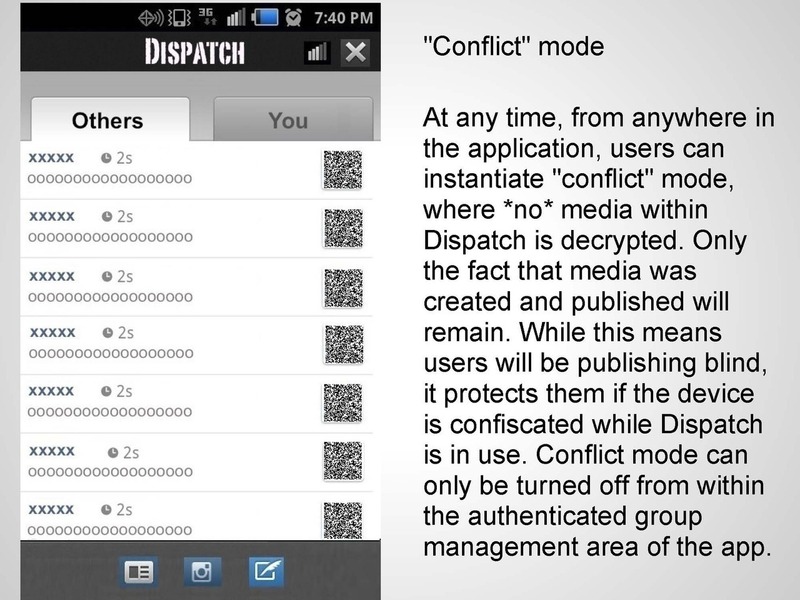 There is also a "conflict mode" during which no media in the application is decrypted. "Only the fact that media was created and published will remain. While this means users will be publishing blind, it protects them if the device is confiscated while Dispatch is in use." The underlying platform for the application is musubi, a non-proprietary social Internet and application platform for phones developed by the Stanford MobiSocial Computing Laboratory.